MILLVILLE, NJ—September 24, 2018 —xG Technology, Inc. (“xG” or the “Company” (Nasdaq: XGTI, XGTIW), whose brands are recognized as the global leaders in live video communications in the broadcast, law enforcement and defense markets, announced that its IMT Vislink was the featured provider of onboard video technology at the 2018 MotoAmerica Championship of New Jersey superbike racing event that was held September 7th-9th at New Jersey Motorsports Park, Millville, NJ. The race was broadcast nationwide on the beIN Sports Network. Video showing footage taken by the Vislink onboard system can be viewed at this link, while the entire rce video can be viewed at this link. Images from the event can be viewed here. MotoAmerica is the premier motorcycle racing series in the U.S. Under the guidance of its president (and former MotoGP® world champion) Wayne Rainey, its mission is to raise the profile of motorcycle road racing in the U.S., and to ultimately send its rides to compete in top-level international MotoGP championships. The MotoGP racing series is the premier level of motorcycle racing in the world. It features many of the fastest riders and most innovative motorcycle technology. MotoGP events are carried by over 100 broadcasters and are seen by over 400 million viewers around the world. 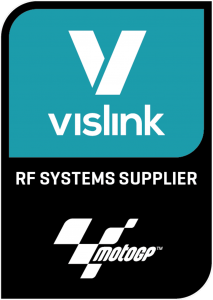 Vislink has enjoyed a long-standing relationship with MotoGP and is their official RF systems supplier, providing onboard, aerial and pitlane camera transmission and receive systems. It was at the 2015 UK MotoGP World Championship that Vislink delivered the world’s first 4K UHD live wireless transmission.